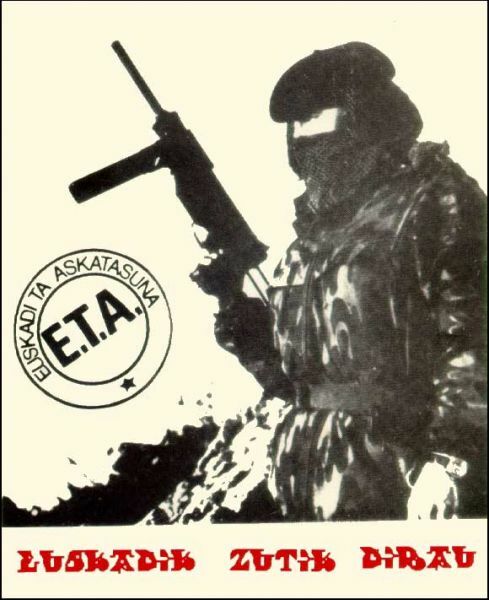 Just a quick post to note the strange events in the Basque Country, both Spanish- and French-ruled, where despite the declared cessation of operations by ETA (the Basque guerilla organisation) authorities in Spain and France have in fact intensified their counter-insurgency efforts. This has been coupled with a refusal to enter into any meanigful negotiations with the Basque nationalist movement, despite several separatist parties making significant electoral gains over the last year. “French police have arrested ETA’s military leader Oroitz Gurruchaga Gogorza and his deputy in a joint operation on the Basque separatist group with the Spanish police. Gurruchaga and Xabier Aramburu were arrested in the southwestern French village of Cauna while travelling in a stolen vehicle with fake number plates, the Spanish interior ministry said, adding that both men were armed with guns. Gurruchaga, 30, joined ETA in 2008 and rose through the organisation’s ranks to become its military and recruiting chief, according to the ministry. The arrests come just over a year after those of then-ETA military boss Alejandro Zorbaran Arriola, known as “Xarla”, and three other suspected ETA militants at a rural house in northern France. “Basque separatist group ETA’s outlawed political wing lashed out at France Monday for the arrest of a man authorities say is the ETA’s military commander, calling it a sign of ongoing repression. The Batasuna party “condemns in the strongest terms” the arrests of Oroitz Gurruchaga Gogorza and his deputy Xabier Aramburu, spokesman Jean-Francois Lefort told AFP, after French and Spanish authorities announced the arrests Sunday following a joint operation in southwest France. Lefort called on French President Francois Hollande’s new administration to “begin finding a solution to the issue of freeing Basque political prisoners” and to “immediately stop all forms of repression”. “The Hollande government, rather than take a positive attitude on setting up a peace process, is managing the Basque issue by the old instruction manual, written by the Spanish government, whose objective is to continue solely down the path of repression, which is doomed to failure,” he said. Batasuna is banned in Spain but legal in France. ETA is pressing for direct talks with France and Spain, but both governments have rejected negotiations and called for the group to disband. French Interior Minister Manuel Valls is due to visit Spain on Tuesday to meet with his counterpart Jorge Fernandez Diaz. The French interior ministry said Monday the two would discuss joint police operations against ETA. During the recent French general election Basque nationalists confronted the then French president Nicolas Sarkozy in Bayonne, forcing him to take refuge in a local café, surrounded by riot police. Since then the French state has been flexing its muscles throughout the French-occupied part of the Basque Country. Seems some states (willfully?) never learn. Neither the Castillian Spanish nor, ironically, the post-revolution French despite their mantra of liberty, fraternity and equality (it seems these are only for those and such as those and were so right from the get go – pace, Touissant L’Overture’s experience of that). And, of course, the perfidious British – primus inter colonialist pares and model for many another lebensraum state construct like Zionist Israel, or repressive Asian regimes et al globally. I am hoping Scottish independence sets the cat amongst these pigeons. It certainly will. All these claims about other EU nations blocking Scottish entry to the Euroclub is rubbish. It would suit Germany, the EU Commission and the ECB very well to see the UK and City of London unsettled by euro-zones to the south (continental Europe), west (Ireland) and north (Scotland). They would certainly try to entice Scotland into euro-membership and use that to “squeeze” the sterling area.